Our ‘Hosts & Champions’ exhibition is shortlisted for the Herald HE awards! We’re very proud to report that our recent exhibition ‘Hosts and Champions: Scotland in the Commonwealth Games’ exhibition has been shortlisted for the Herald HE awards. 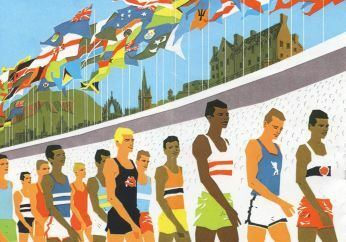 ‘Hosts and Champions’ is a touring exhibition celebrating over 80 years of participation and achievement by Scotland in the Commonwealth Games from its origin as the British Empire Games held in Hamilton, Canada in 1930, through to the Glasgow 2014. The exhibition has been widely acclaimed in all of its tour locations with many visits from Commonwealth Games athletes who have gone on to donate further items to the archive. You can see the exhibition when it comes to the MacRobert, here on Stirling Campus from Thurs 23rd July – Fri 11th September 2015. Read more about Hosts and Champions.